I'm back for another round of crock pot freezer meals. I've done two of these previously- here and here. This time I purchased all my ingredients at Aldi's for only $225 and ended up with 20 meals. 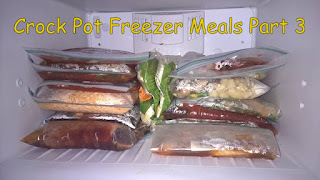 I made a few other freezer meals too, but they're not for the crock pot so I'll post those separately.